I’ve almost finished the core of the warband with the bloodmage! I actually have three more additions before I’m happy and can start painting. One which I’ll drop a few WiPs of at the end of this post. 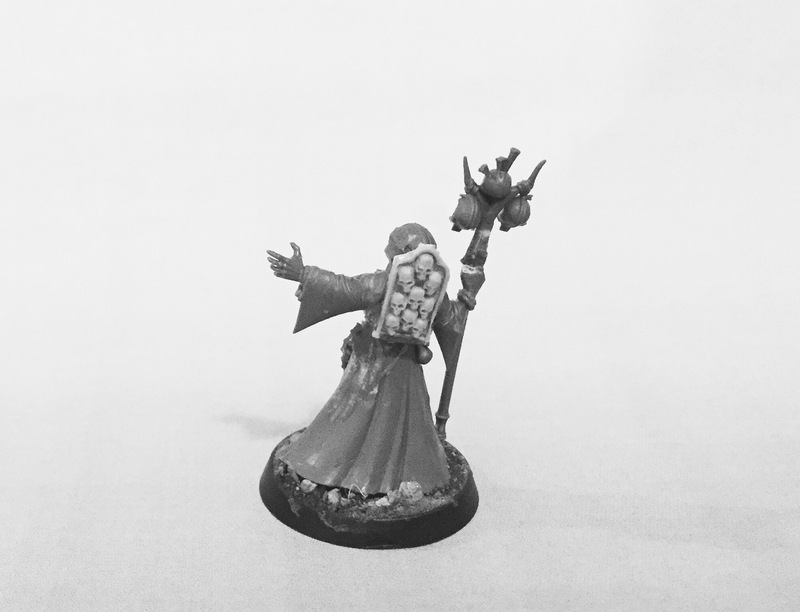 This dark wizard can possess the Blood Pact with daemonic spirits.. He radiate a sense of irrational fear and have access to many other powers involving blood.. Though beyond that I feel the conposition strikes those key buttons and leaves the impression of a fearsome figure that would be able to impose his will just by his sheer size. Just look how tall he is in comparison to the rest. Other than that I kept him simple and unadorned and I think that’s an improvement. Mine is bigger than yours.. So a week or two ago I started on a big guy for the Blood Pact. A merge between a slaughterpriest and Skarr Bloodwrath or whatever he’s called to make a very imposing and aggressive minotaur/abhuman. Finally getting somewhere with it I proudly dropped a pic of it in our Vortapt IV chat group. So I regrouped and made this. Cheers Alex! Yeah and I like the dynamic these add to my warband as their not so militaristic. Is that… a Khornate wizard?! 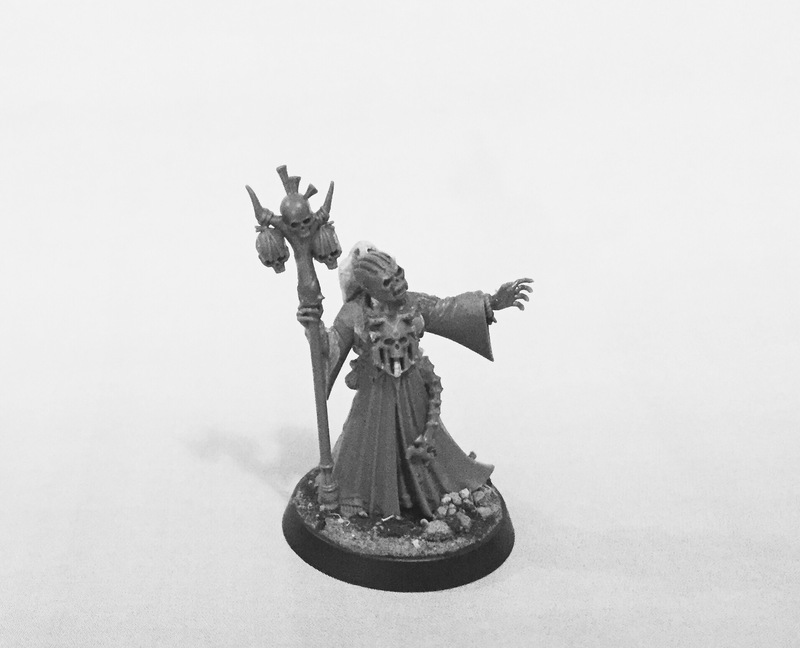 The Blood God will be conflicted on this one – if all his wizards look this good he might have to reconsider his anti-magic stance! Where is the blood-mage’s head from? 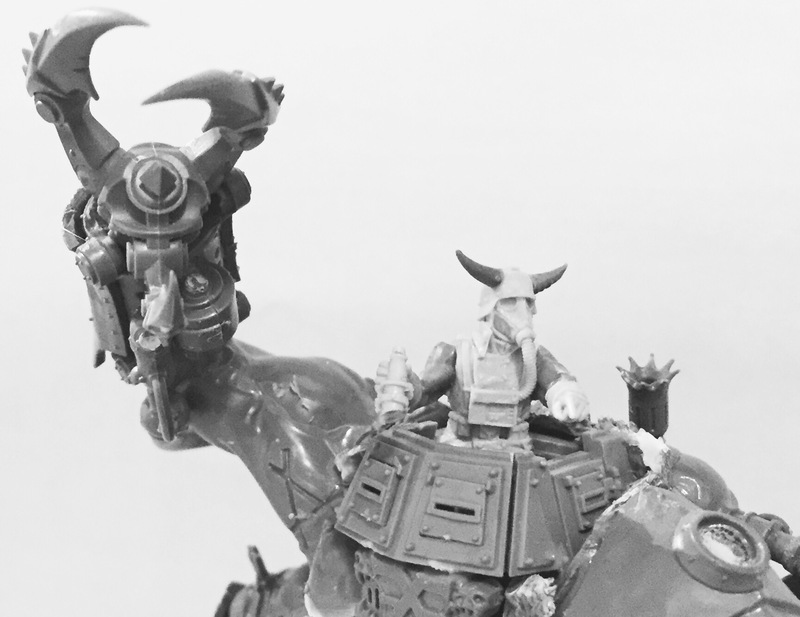 The big guy is looking good as well – the horns on the DoK trooper make him really evil looking. Take it you’re planning to greenstuff over the skaven symbols on Boneripper’s body? Looking forward to seeing him once he’s finished. The head is one of the guys from the Gorechosen game with the bunny ears removed. 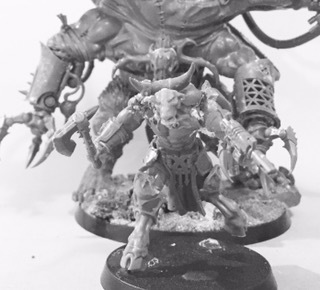 Aye, that’s always the kicker – ‘we’re Chaos, but we have rules!’ The thing that strikes me about Khornate wizards – and that makes me play with the idea of making some of my own – is that we the fans know that Khorne hates mages, but why would the mages themselves know that Khorne hates them? 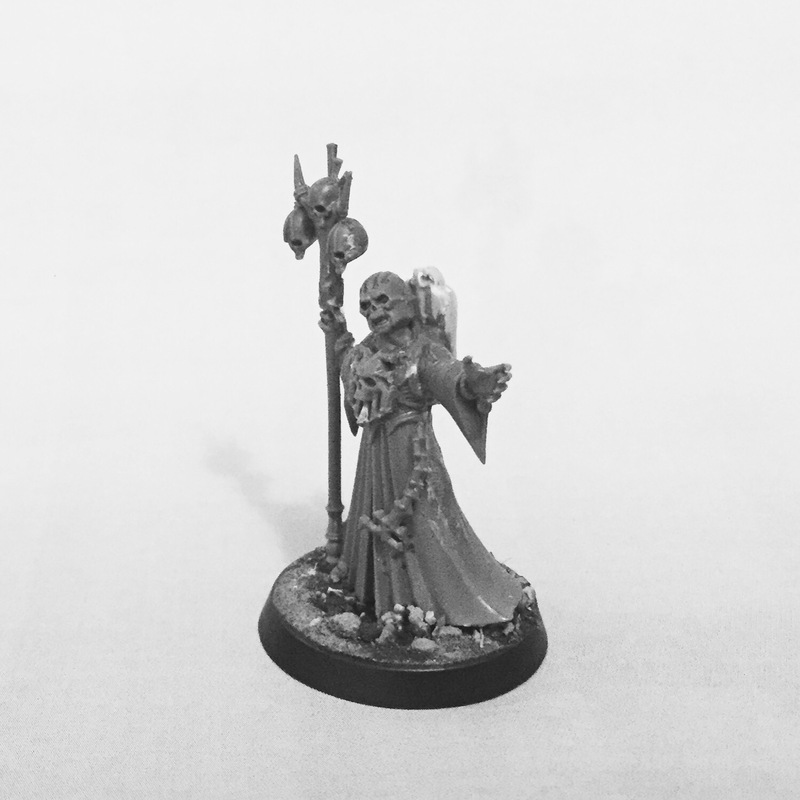 If someone worships something akin to Khorne as a god of battle, and is a mage, then in essence they are a Khornate mage – no matter how pissed off about it the big guy might be. Every single Chaos cult will have its own imperfect understanding of the Dark Gods and their goals, there isn’t a bible for them to draw upon (and even if there was we see from the real world how many different interpretations of a single text there can be). I imagine there are actually millions of different cults and subsects each with their own interpretation of the Gods. Precisely! I like having the rules there, I like having a framework, but the point of good rules is to break them with style. Been following the creation of this band without commenting, Everything looks Aces! Even more awesome work coming out of the green brain of yours! Loving seeing your creative work come about.